This wonderful hybride uses the housing of the original Speak & Spell from 1980 with the modern electronics of the first Super Speak & Spell. 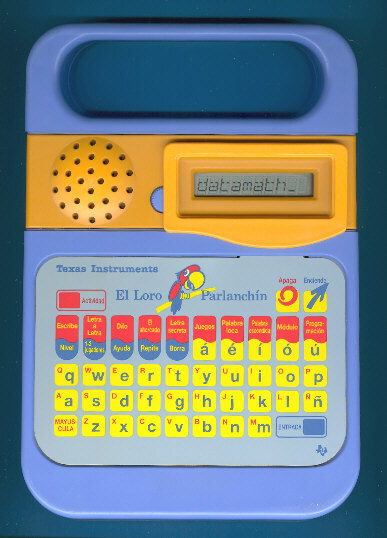 The English speaking sibbling of this Spanish talking El Loro Parlanchin was called Super Speak & Spell, too. The toy is intended for players ages 6 to 11. We know with El Loro Profesor a second Spansih speaking version of the Super Speak & Spell. From the manufactureing codes we assume that the El Loro Profesor is the successor of the El Loro Parlanchin. A similiar product was introduced in France with the La Super Dictée Magique and in Italy with the Grillo Parlante Piu. Please find the manuals of the listed modules in the Download Section of the Datamath Calculator Museum. © Joerg Woerner, May 6, 2007. No reprints without written permission.